It all started three years ago, when Cambridge College, after surveying a number of potential sites for its regional campus, settled on some former retail space on the ground floor of Tower Square. Now there are four colleges and universities with what could be called a presence in the central business district. That constitutes a “hub,” according to many we talked to about this development, one that has the ability to bring additional energy and vibrancy to the downtown area. When Supreme Court Justice Sonia Sotomayor spoke at the MassMutual Center on Sept. 9 as part of the 2015 Springfield Public Forum series, there were more than 2,500 people in the hall. A good number of them represented the area’s many colleges and universities, including students, faculty members, administrators, distinguished alums, and supporters. Springfield College, for example, had roughly 40 people in attendance, and prior to Sotomayor’s talk, most of them were gathered at a reception in unique community space set aside for tenants and their guests on the third floor of 1350 Main St., just across the street from the convention center. The college wasn’t officially in the building yet, said its president, Mary-Beth Cooper, but lease papers had been signed for space on the second floor just a few days before Sotomayor came to Springfield, so the school took full advantage of a huge opportunity. Mary-Beth Cooper says Springfield College leaders wanted to be part of the downtown revitalization in the city, so an address in the central business district made sense. Gaining the ability to host such a party wasn’t the reason why Springfield College became the fourth area institution of higher learning to add a downtown Springfield mailing address over the past few years. But it may well have been one of the reasons. There are myriad others, said Cooper, who told BusinessWest that, to make a somewhat long story short, the college wanted to support the city it is named after, and, perhaps more importantly, it wanted to be part of what’s happening downtown — be that a revitalization, comeback, renaissance, or whatever term may be deemed appropriate. 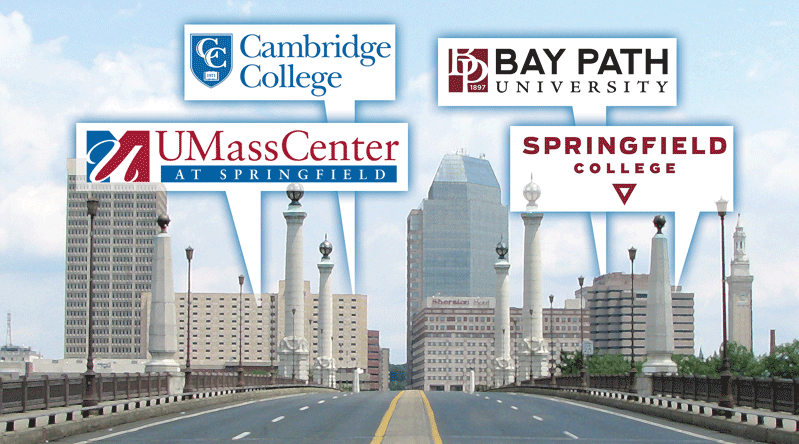 Thus, Springfield College is now part of what would have to be called a movement involving higher education and Springfield’s central business district. It all started in 2012, when Cambridge College, looking for a replacement for tired and insufficient facilities for its Springfield Regional Center in an industrial building on Cottage Street, settled on long-vacant retail space on the ground floor of Tower Square. Two years later, Bay Path College, bursting at the seams on its Longmeadow campus and in search of a home for its American Women’s College, chose the spacious seventh floor of 1350 Main St. from several appealing options. And in September of 2014, The University of Massachusetts opened the UMass Center at Springfield, a 26,000-square-foot facility on the mezzanine level of Tower Square that is now hosting classes involving roughly 700 students this fall. By comparison to those other facilities, Springfield College’s investment is small by any measure — its offices total less than 2,000 square feet, and only a few people are actually in those offices at any given time. “Eds and meds are an important part of economic development,” he said, using the term to connote the education and healthcare sectors. “And when you couple what’s happening with the colleges downtown with efforts to promote entrepreneurship, the innovation district we’re building, and the efforts of groups like Valley Venture Mentors, it generates additional momentum. “Years ago, people laughed at us when we said we were going to bring colleges and universities into the downtown,” he went on, adding that no one is laughing anymore. Instead, they’re undertaking some speculation and analysis — on the impact of all this proliferation of colleges along Main Street, and about how and in what ways this momentum can be built upon. Lynn Griesemer, assistant vice president of Economic Development at UMass and executive director of the UMass Donohue Institute, has been doing some analysis herself. 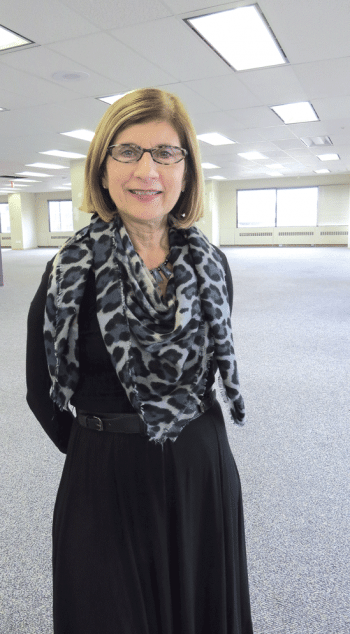 She told BusinessWest that what’s developing downtown could certainly be termed an “education hub,” one that has the potential to attract additional businesses, non-profits, people, and vibrancy to the area. For this issue and its focus on education, BusinessWest looks at how this hub, or magnet, came to be, and also at what its potential forces of attraction might become. Hot Table restaurant on the ground floor at Tower Square is now open until 8 p.m. on weekdays, several hours later than its old closing time. 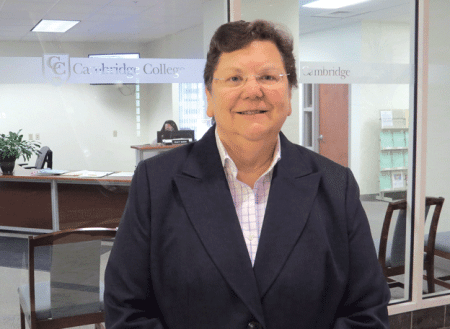 Teresa Forte, director of Cambridge College’s Springfield Regional Center, located just a few dozen feet away, knows that prodding from her and many of the students who attend classes into the early evening played a big part in that decision. Overall, she believes that’s only one relatively small example of the impact that Cambridge and the other colleges are having downtown, an influence she described with the same phrase Greisemer summoned. Looking back over how this hub came together, it becomes clear that, while the schools involved had somewhat different motivations and goals behind their respective decisions, the common denominator is that they reached a decision that they wanted — and in many respects needed — to be downtown. Retracing the steps that led to Cambridge becoming urban pioneers, if you will, or at least next-generation pioneers, Forte said the school looked at a number of options as it went about the task of replacing the Cottage Street facilities, which it called home for more than 20 years. At the time, the school wasn’t really focused on being part of a revitalization effort — although that was certainly part of the equation — as much as it was centered on making a move that simply made sense from the perspectives of visibility and convenience for all constituencies involved, and would enable the school to ultimately grow enrollment, she explained. “I described us as the best-kept secret in higher education in Springfield — even our sign didn’t light up,” she said of the Cottage Street facility. “Our lease was up, and the decision was made to search for a new, upgraded location. After many months and many visits to locations all over Springfield, it became clear that the best options for us were in downtown. Elaborating, she said Tower Square has a very responsive security staff which conducts patrols on the hour both inside the mall and outside the perimeter of the building, and there are also cameras everywhere, including the garage. Meanwhile, in terms of parking, students are given the option to park in the Tower Square garage, meaning they can take the elevator to class. With that package of amenities, Cambridge thought it could grow its Springfield Regional Center, she continued, and in reality, that’s exactly what has happened. Teresa Forte says Cambridge College’s location in Tower Square — which offers students solid security, parking, and transportation amenities — has spurred an increase in enrollment. For UMass, meanwhile, its arrival downtown, while certainly part of ongoing efforts to become more of a factor in Greater Springfield economic-development efforts, was actually sparked by a statewide study of potential growth opportunities for the university apart from its five campuses, said Griesemer. That analysis identified several such locations, she went on, including Brockton, Southeastern Mass., Springfield, and the Marlboro area in the eastern part of the Commonwealth. “There is a whole wedge in that area that has no higher-ed institutions — it’s between Routes 128, 495, 2, and 90,” she said of what amounts to Greater Marlboro, adding that most of the sites identified were in so-called Gateway cities (many of its existing campuses are in different ones) such as Springfield, and the university decided, after an in-depth market research study, to first pursue a project in the City of Homes. What eventually emerged was the UMass Center at Springfield, which was announced in the fall if 2013 and opened less than a year later. It now hosts classes for several UMass Amherst programs, including the College of Nursing, the Isenberg School of Management’s part-time MBA program, the University Without Walls, and others. It also hosts programs offered by or in conjunction with UMass Boston, Springfield Technical Community College, Holyoke Community College, and Westfield State University. Griesemer didn’t have a specific number when asked how many people are at the Springfield facility on a given day, but pegged student enrollment alone at between 600 and 700, a number that has gone up each semester. 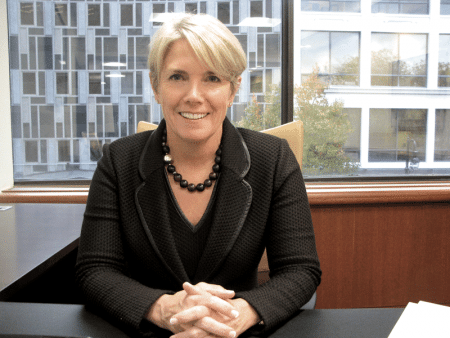 As for Bay Path, its move downtown in the fall if 2013 was generated by a basic need for additional space for the online American Women’s College, said President Carol Leary. “We spent a good amount of time looking at various locations, but Springfield was at the top of our list because we have our roots there going back to 1897,” she said, adding that school administrators fell in love with the culture at 1350 Main St.
And by culture, she meant everything from its focus on the arts — there are several galleries there — to its eatery to its eclectic mix of tenants. “You have a feel, when you enter this place, that it’s more than an office building,” she explained, adding that the 11,805 square feet now in use hosts roughly 40 full-time employees. And they are certainly contributing to the health of the local economy, said Leary, who attended college in Boston, understands and appreciates how higher education adds vibrancy to a city, and enjoys being part of that equation locally. Cooper said Springfield College’s ties to the City of Homes obviously run even deeper, and they certainly played a part in the school’s decision to lease some space at 1350 Main St.
She said she was having lunch downtown with trustee vice chair Jim Ross, when the discussion turned to the city, it’s central business district, and the many things happening there. “We talked about MGM, the rebirth of the city, transportation … everything,” she recalled, adding that the conversation eventually evolved into a discussion about if and how to become part of it — or a bigger part. Actually, Cooper says she’s been asked several times since she arrived in the fall of 2013 about the school establishing a presence downtown. She was intrigued by the questions, in part because, in many ways, she thought the school was already downtown. It is only a few miles as the crow flies from Main Street, she acknowledged, adding quickly that, through her lunch talk with Ross, she came to the conclusion that a direct presence in the CBD was an appropriate step. Bay Path University President Carol Leary says the school’s space at 1350 Main St. has plenty of room for expansion. Fast-forwarding a little, Ross and the college are now essentially sharing space on 1350’s second floor. The former conference room for a bank has been converted into a conference room and two offices, one for Cooper and one for Ross. It’s not a big presence, certainly, and its specific uses have yet to be determined, but the college is now a part of what is becoming an increasingly larger and more impactful whole, said Cooper, who, when asked what she has in mind for the space besides receptions, told BusinessWest the same thing she told her board. “I want people to think about the possibilities,” she said, listing everything from candidate interviews to leadership team sessions to subcommittee meetings involving the many boards she’s on. But she wants that’s phrase ‘think about the possibilities’ to extend well beyond how the school’s physical space may be used. Indeed, she said the expanding higher-ed presence downtown may well inspire and facilitate additional collaborative efforts involving a host of area schools, and eventually generate more opportunities to pair area students with downtown businesses through internships and other programs. As she gave BusinessWest a quick tour of the Bay Path suite of offices, Leary, who spends two full days a week downtown, stopped at the spacious kitchen. It is very well-stocked and outfitted with every necessary appliance. There are also several round tables and chairs arranged café-style. They get a decent amount of use, said Leary, but many of those working at the downtown location prefer to eat out, and do so quite regularly. Many are also members of the gym upstairs, she went on, adding that membership was paid by the landlord the first year (another perk of tenantship), but several employees are staying on even though the cost has shifted to them. Meanwhile, Hot Table’s hours have expanded; the store that UMass operates on the ground floor at Tower Square, the UMass Marketplace, has expanded its food offerings; and Griesemer said there have been more than a few conversations lately about the lines at most downtown eateries getting longer — and how that’s a good thing. But the more serious talk is about how the proliferation of colleges downtown will have a much deeper impact than a bottom-line bounce for downtown dining establishments. Griesemer relayed some recent discussions that more than suggested that the schools are helping to foster an environment that may draw more draw more employers — and employees — to the central business district. Sarno agreed, and noted that the critical mass of students, employees, and administrators created by the movement of higher education into the downtown area will only facilitate efforts to create more market-rate housing there, which is considered one of the keys to generating more vibrancy and additional retail. When asked if there was a model for a larger, more sophisticated education hub that Springfield could aspire to, she said there are several, including Phoenix. While the current picture is one defined by enthusiasm, and there is considerable optimism about what might come next, the immediate forecast is at least somewhat clouded by two concurrent, and massive, construction projects that will certainly impact access to the downtown — MGM’s South End casino and reconstruction of the I-91 viaduct. Sarno said the city — not to mention the contractor handling the I-91 work — is certainly incentivized to do just that, and also get the project done on time. As she wrapped up her tour of Bay Path’s facilities, Leary spent a few moments in the cluttered, currently unused space on the seventh floor into which the school could, and likely will, expand. With those sentiments, she spoke for seemingly everyone that is now part of this education hub in the central business district. In fact, by almost all accounts, those within this key sector are just getting started.